Enjoy a casual dinner in Seal Beach on main street. With 180-degree views of the ocean, it's a little heaven on earth. Choose from a wide variety of New American Food that's delicious and reasonably priced. For nightly dinner specials, we offer some of the best value. The Hangout is one of the best places for Seal Beach Dining with ocean views in the heart of downtown. Our friendly and knowledgeable Waitstaff makes it easy. Food portions satisfy no matter how big your appetite is! All of our dishes are prepared using the finest ingredients. Choose from many unique Cocktails, Beers on tap, or Californian Wines. To the right of the pier is Eisenhower Park with a small fenced in playground. It's an ideal family activity with kids before or after your evening meal. Experience our award-winning food and hospitality. From the 405 North, exit 22 or if 405 South 24B. Our New American Menu runs the gamut. We can please just about anyone. See a few popular Dishes below. Over Creamy Grits & Roasted Corn Salsa. Loved this true Cali dinner experience. Great for breakfast lunch or dinner. Club sandwiches, and seafood pots are excellent choices. Huge portions. Known locally for good cocktails. Very effective staff. Beach views. Red Potatoes & Sautéed Vegetables. A choice Beef Burger with a kick. Pepper Jack Cheese, Grilled Jalapeños, Crispy Onions and our amazing Memphis BBQ Sauce. Lobster, Clams, Shrimp, Mussels, Andouille Sausage, Red Potatoes, Corn & Veggies. 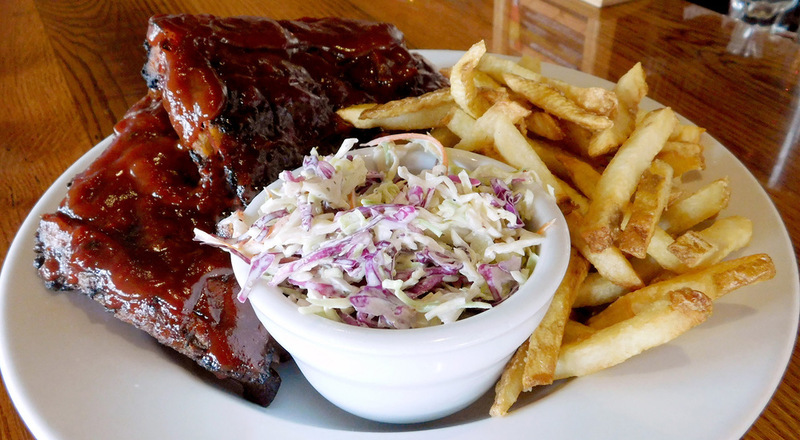 Baby Back Ribs cooked to perfection with Memphis BBQ Sauce, Sides of Crispy French Fries and Cole Slaw included. Slow-roasted beef brisket with Au Jus, Creamy Horsey Sauce, Mashed Potatoes & Southern Greens. Meatloaf with Mashed Potatoes & Seasonal Veggies. Hand-cut 10 oz. NY strip steak with Red Potatoes and Veggies. Served with house-made Cocktail & Chipotle Aioli Dipping Sauce. If you’re seeking a quiet dinner and drinks for two, we suggest you come early. As the night moves on, our atmosphere is lively. To start, sit at the bar. Get to acquainted with Our award-winning bartender Joey Ingalls. She can tell you about the drink of the week or suggest something you have not had. For appetizers. There’s deviled eggs, pull pork sliders, fish tacos, or shrimp cocktail. There’s also a variety of fresh salads if you want to share. For dinner with a view, grab a table by the window overlooking the pier. Parking on Main street is free for 2 hours. Staying longer? Park in the beach lots.